Is graffiti infecting your neighborhood, home or business? Vandalism is a big problem in Wisconsin and when you need graffiti removal Fast Midwest Maintenance LLC can have it removed within 48 hours. When you let Graffiti sit it is harder to remove and it is a flag for other vandals to come put their graffiti tags over the existing graffiti. When possible remove all graffiti as soon as you can, for two reasons. #1 Depending on the surface whether its brick, siding or wood it will come up a lot better without leaving a trace of past graffiti. #2 It is a proven fact that when graffiti removal is done before other vandals get to put their graffiti over the old graffiti, your chances of repeat graffiti are a lot slimmer . As you can see in this picture one vandal tagged right over the other Graffiti, making it a bigger problem and more of a mess. When it comes to Grafitti removal you want to make sure its done correctly. 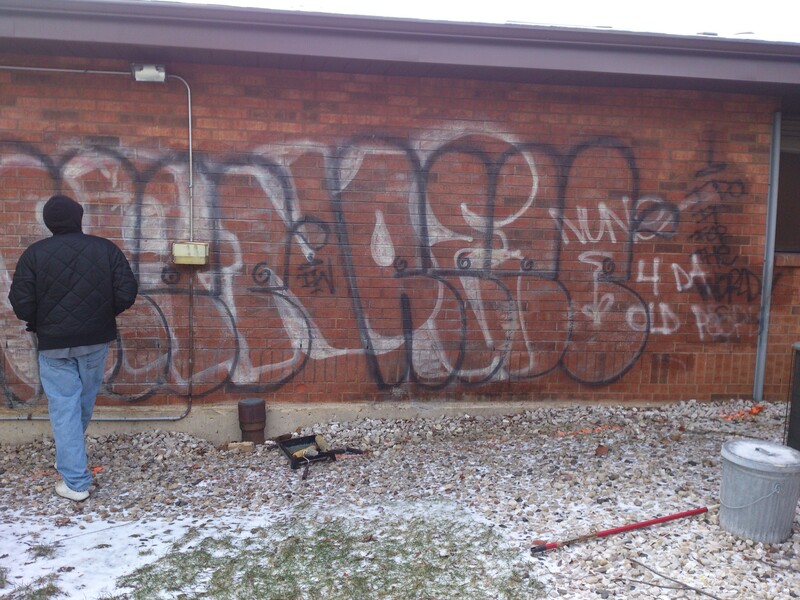 When Midwest Maintenance takes a Graffiti removal job we do a detailed inspection of site. So the surface is properly identified, then we can choose the correct solution to remove the graffiti without damaging your property. We only use the highest quality graffiti removal solutions and techniques, so we only get the best results. 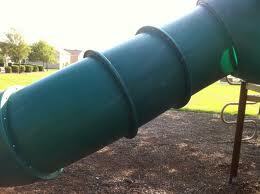 As you can see the graffiti was completely removed from the playground. Now the Vandals will think twice about coming back. It is unfortunate but there are some areas that are prone to Graffiti and as fast as you remove the graffiti the Vandals are back at it. Well for these extreme situations we have an answer. It’s a special product that is a Shield to the Graffiti. They can Tag all day but the paint will not penetrate your surface. So it will wash off easily and with this application your graffiti protection will last years. If you have a graffiti Problem in Wisconsin or Northern Illinois We can remove the Graffiti and keep you property clean and protected. Tips to keep Graffiti vandals away. In Wisconsin Graffiti tends to be a problem in alleys and areas that are not well light or areas that are not heavily populated but can be seen buy a lot of traffic. So here are a few tips to keep the graffiti vandals away. Keep the areas well light, this tends to keep the Vandals away. 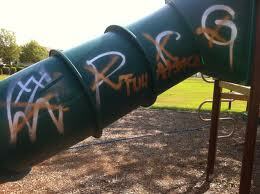 They don’t want to get caught and a well light area can help the graffiti vandals get noticed at night. If possible cover areas with Foliage, plant bushes or trees. The reason vandals use graffiti is for people to see that they are claiming that area and if it’s no longer a visible area they will choose another place that is more visible for the world to see. Get a security system, as in cameras , Motion sensors ,alarms, anything that resembles trouble for the graffiti Vandals. My Favorite graffiti protection get a dog, nobody wants to meet a dog in the dark hours of the night plus a dog bark just brings a lot of attention to a graffiti vandal trying to be sneaky .